The 4th Annual Lake Simcoe Championship Ice Fishing Derby is to be held on the 17th of February 2019 to support underprivileged children through Canadian Tire’s Jumpstart Charities. Commencing with sign-ins at 6:00 AM, the championship runs from 8:00 AM to 1:00 PM. Lake Simcoe Championship Ice Fishing announced the launch of the 2019 derby. The event will be held on the 17th of February, 2019 between 8:00 AM and 1:00 PM. The premier ice fishing event boasts a cash $17,500 prize pool and is open to two-person teams. The 4th Lake Simcoe Championship Ice Fishing Derby was announced to be held on Sunday the 17th of February 2019. The event has a $17,500 cash prize pool for the heaviest 12 Perch starting with a grand first prize of $10,000. There will be over $10,000 in extra Participants prizes. The Lake Simcoe Championship Ice Fishing Derby is an annual marquee fishing event that tests ice fishing teams from Canada and around the world. Canadian participants are not required to hold a fishing license to participate in the marquee fishing tournament, although adherence to fishing limits is mandatory. Sign-in for the event commences at 6:00 AM and the tournament runs from 8:00 AM through to 1:00 PM. The annual fishing derby benefits Canadian Tire’s Jumpstart Charities, an organization working to help children through ‘Get in the Game’ with opportunities to enjoy physical activity and organized sporting events. Supported by Canadian Tire Keswick, the event also features a lottery with $50,000 in prizes including tires, bbq’s, trips, event tickets, sports memorabilia, small appliances, tools, equipment accessories and gift coupons. Lottery tickets cost $10 and are available at Canadian Tire Keswick and other locations in Ontario. Darcy Tucker, a Jumpstart Ambassador, and MPP Caroline Mulroney will be drawing the lottery winners starting at 10 AM Sunday 17th of February 2019. Check in and Inspection between 6:00 AM and 8:00 AM. Participants will only be permitted to drill holes after 8 AM. The final weigh-in closes at 2:00 PM. Registration fees for the event are priced at $250 for a two-person team. The first two hundred registrations will receive a Loot Bag containing lottery tickets, minnows for bait and other prizes, totalling over $100 in value. Over $125,000 was raised in the first three years! This year the goal is to raise another $100,000 and increase awareness for Canadian Tire Jumpstart. According to a spokesperson for Lake Simcoe Championship Ice Fishing Derby, “From the success of our past derbies and the support of Canadian Tire for the Championship Ice Fishing Derby at Lake Simcoe, it is expected the 2019 derby will attract ice fishing professionals and sportspersons from the local community, Ontario, Canada and the USA to the event. 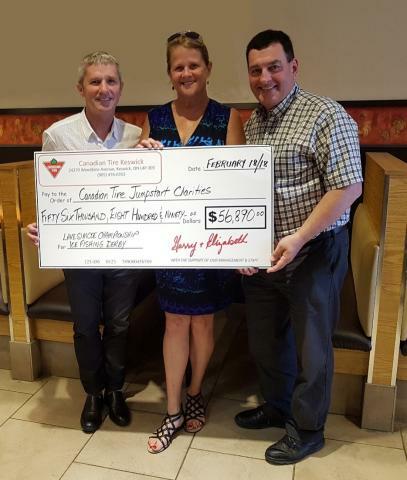 We look forward to being able to support the work of Jumpstart Charities to bring sports to disadvantaged children in Canada.” More information is available at Canadian Tire Keswick or the URL above.